So, nests… A totally different approach to bird identification. Bird chicks are classified into two relatively distinct groups; precocial and altricial. Precocial chicks are born in a far more advanced state: partly feathered, they can walk pretty much as soon as they hatch and to a certain degree can take care of themselves. Ground-dwelling birds like francolins, guineafowl and ostriches are the types of birds we typically refer to when we think of precocial chicks. Since the chicks can move and follow the parents around, nests are generally little more than a scrape in the ground. 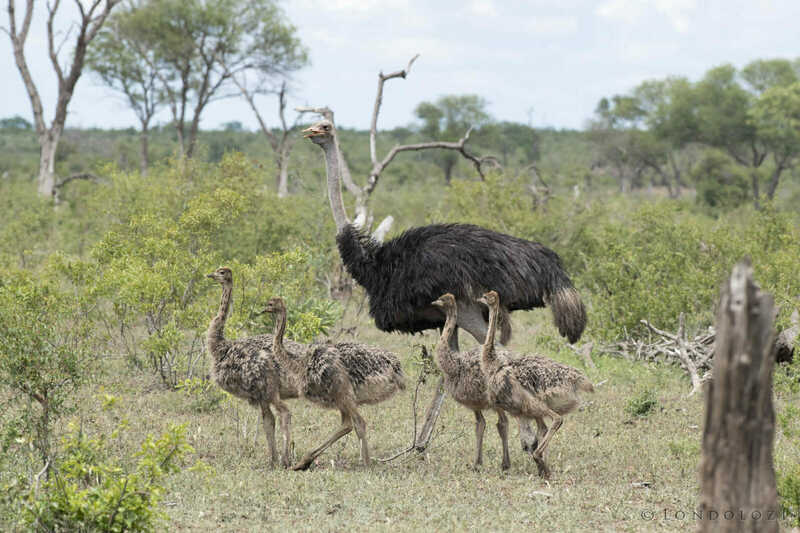 Ostrich chicks can walk almost from the moment they hatch, and are therefore highly precocial. Altricial chicks on the other hand are – in a word – useless. They are born severely underdeveloped and need a high level of parental care during their formative weeks and months. They generally grow rapidly, but hatch without feathers, are blind, and need to be fed constantly. It stands to reason then that they will need some kind of protection while their parent(s) are off getting food for them, and this is where the nest comes in. Nests are there almost solely to provide protection for the eggs and young. You won’t find a pair of birds simply setting up a nest and living there (at least to the best of my knowledge); they build nests in/on which to raise their young. Like birds themselves, nests come in an incredible diversity of shapes and sizes. Stick nests, woven nests, hole nests, nests made out of mud, nests made out of spider webs… the list goes on. Nest-building itself is a fascinating sub-section of birding, and knowing what type of nests belong to which birds goes a long way towards understanding various facets of their behaviour. This week’s Bird Challenge is centred around a nest. The bird itself also happened to be sitting on said nest, and there’s probably enough of it visible for wily birders to be able to ID it, but it’s the nest itself that is quite distinctive amongst this bird family. Let us know what bird you think this is, and as usual we’ll reveal the answer in the next Week in Pictures. Now this is a challenge! I am rubbish at identifying nests. I am going with a Long-billed Crombec (Sylvietta rufescens) with this one. Interesting information. No idea what bird it is. To be honest James I could not see the bird on my phone at first. Desmond said look on your PC. Maybe time for new spectacles. I must go with Declan on this. It is a long-billed Crombec. It was the nest I looked at first as we have seen many like that before. I always thought it was spider nests. It is a purse nest buildt with spider webs and sticks. Nice blog on birds James. My guess is a weaver. My second guess would be hummingbird, however, am unsure if they are found in Africa. Thank you and I look forward to the answer next week. 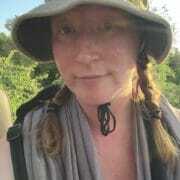 Have a good week in the bush. 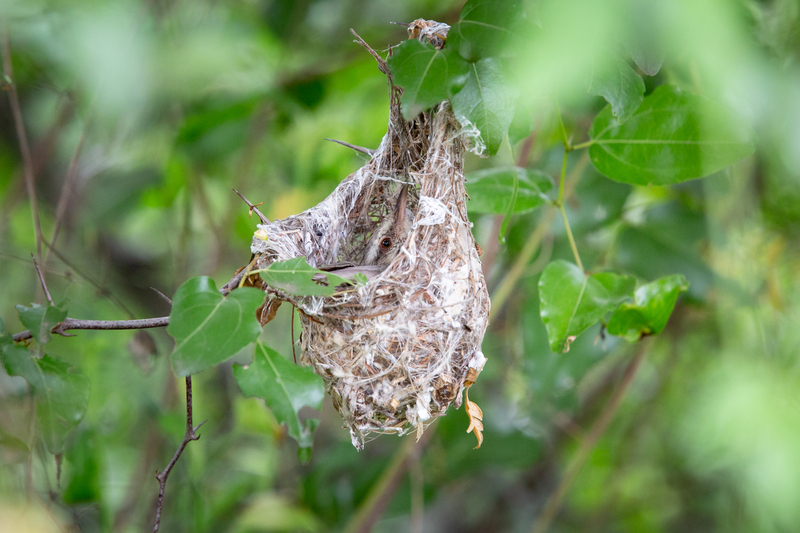 I don’t know a lot about birds but I remember some of the weavers had nice nests like this that seemed to be deep and cozy. Is this bird a kind of a weaver bird? After researching nests, I initially thought it was some specie of Weavers, but now I’m thinking it is a long billed crombec, as the best is a bit messy…..